Just before I receive my big, last-night Chanukah present, my family gathers in the front room of our Brooklyn house, where the wind leaks through the front window panes and blows the flames on the menorah candles to the side, rushing them through burning, as if we were in a hurry for this coziest night, eight candles strong, to be over. Which part of me is, because I can’t wait to see my biggest present, and if I’m right about what it is, ride my brand new bike for the first time the next morning. It’s 1977 and I’m six. My father, often warm and cuddly, but also quick to growl, looks down upon the training wheels that came with the schoolbus yellow bike that he had picked out for me. “You can use them for now, but you won’t need them in a week or two,” which makes him sound like he can see the future. And, what seems like only a week later, my bear of a father, with wide-knuckled hands, a long, round torso and hairy legs, makes the decision. I come outside one morning to find him using my favorite of his tools, the clicka-clicka-clicka socket wrench, taking off the training wheels and the brackets they come on. He has been telling me it was time to take off the training wheels for a couple of days, but I still feel tippy and insecure, and I was hoping maybe he might forget. He’s holding the bike from the side, handlebars and the metal bar at the back of the seat, and looking at me. I grit my teeth and get on the bike. At first he steadies me from the side, and as I pick up speed, he runs behind me, holding the bar on the back of the flowered banana seat. And then like a snapped cable, I can feel that he is no longer there. Three pedal strokes, and the world goes slanted, rushes up to meet me. My knee is stinging from the impact, blood beginning to flow beneath thick denim. I drag the bike back to where he is standing, and drop it on its side. “See?” Pre-cry, the word comes out creaky. It is my first ever confrontation with my father, and it won’t be my last. He picks up the bike and gets on, contorting himself small, to fit. He rides it back towards the house, the bike impossibly small, his legs splayed out wide, the yellow streamers blowing out ridiculous, a giant bear on a tiny toy bike. When I see him on it, I forget to cry. I want it back. My ride ends here, and next I’ll take a bus to Christchurch, and north, back towards Auckland. Now that the ride is over, I’m looking for something else to do, to hold onto that feeling of accomplishment and pride that I get from pushing myself. In this steampunk town, there are Victorian-dressed ladies as if I was the anachronism in beige zip-off travel pants. I decide to try my legs at a penny farthing, the name for a bike with a giant wheel in the front, and a tiny one in back, the seat resting at the top of the big wheel, which is as tall as I am. There are no brakes or gears, and there’s no way you could possibly put your feet down in case you start to lose your balance, and there are definitely no training wheels. From where I stand, the world-gone-slanty probability is very high, and yet, I’m intrigued. I get on the bike, and Bruce, from the shop that rents the bikes is behind me, making sure I don’t fall. I’m holding on a pole for balance, when he says, “and you’re off.” And I am. I feel him steadying the bike, and I’m pedaling. The tires are solid rubber, not inflated, and I feel the occasional crack in the asphalt through the hard leather seat. I am riding higher than horse-height, and the world sails smoothly by, full of trees and a town square, and the occasional car, and now, Bruce, jogging next to me. “What are you doing over there?” I ask, surprised to find I am doing this alone. And I am. I can ride bikes big and small, on continents far and near. My father left a lot of unfinished business when he died at exactly the age I am on this bike ride—39. He didn’t finish raising his daughters, and he didn’t celebrate many more Chanukahs in the front room of our house with the leaky window that always burned down the candles too fast. But maybe his job never was to keep me protected. Not when he let go when I was riding a two-wheeler for the first time, and not later, when I was ten, and he was gone. His lesson was something else. Sometimes you fall and get injured, and sometimes, with a guy named Bruce running beside you, you slow the bike, and come back to the tall pole where you started, place a shaking foot on the dismount pedal before coming back to the ground. Either way, you stand up again. 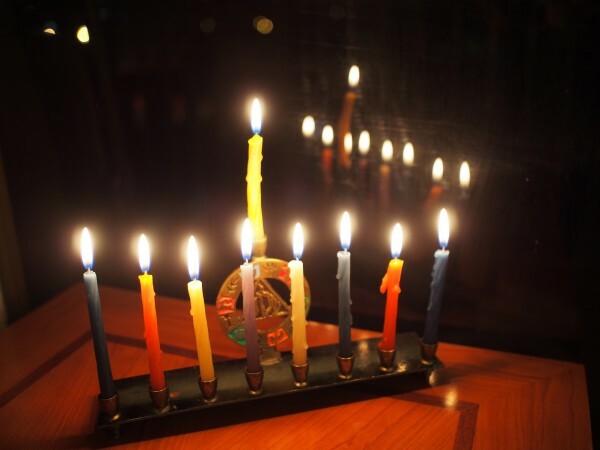 This year I’ll be celebrating Chanukah with friends at my home in Santiago, Chile. We’ll light the menorah, and eat latkes, and my father won’t be there to steal one right off the plate, before they come to the table to be served with homemade applesauce and sour cream. But if I’m lucky, and it’s not too hot out, I just might get in a bike ride. This piece is excerpted from a memoir in progress. All rights reserved. For inquiries, please write the author at 39thememoir at gmail.com or use the blog’s contact information. So great to read this, Eileen, after hearing about it. There’s also something to having actually met you and then reading your voice. I imagine you telling me the story face to face in our living room. I can’t wait to read the rest. It’s funny you mention that. I almost thought about making a voice post, but then didn’t. But one day, I’ll read the audio book! 🙂 Thanks, Leigh. I have done some voice pieces before. In the future I might like to do some slideshows, for which I wouldn’t have enough for this piece, but I could probably get an illustrator, for example. I’ve always been intimidated by the penny farthing but tempted to try it in my I-can-ride-any-bike way. If the whole memoir is like this, bikes or no, where’s the place I put in my pre-order? It was fairly terrifying, but then surprisingly easy. The manuscript is “finished,” just have to find an agent, and then a publisher. Working on the proposal as we speak. Thanks, Ellen! Very nice, and I do like the south island of New Zealand. Best of luck. Thanks, Jamie. The south island was an incredible place to turn 39. Or any age, probably. Thanks, Rosanne. I guess it’s pretty universal. The good news is, they say we never forget how to ride, so we shouldn’t have to do it again! Elisa got a bike for her 6th birthday in September. She’s still learning to ride without the training wheels. She’s terrified! I hope she goes on a bike ride in New Zealand some day though. Hey, maybe I’ll go with her! I can feel Elsa’s pain at the terror, Silvia! I’m sure one day she will travel the world, just like her mom and dad (well, and her, up to this point!). The audiobook version will be the icing on the cake. I’m so glad you enjoyed the piece. I really value your feedback! I enjoyed reading your piece, Eileen. Happy Holidays. You have just transported me in time and space. I am so proud. Can’t wait to read more. Made me cry. So tender. Just as my bearlike father ran down the homemade ice slope on the neighborhood hill with me on a wooden sleigh at the age of five, advising no to put down my feet at the foot of the hill, because he would do the braking. My lower leg ended up below the skid with both of us on top of it and my growling father made me walk home with the limping leg. He did not die, just vanished at the age of 36 to the other side of the Berlin wall. Yurdis, I did not know this about you. You made me teary, too. Sleds, bikes, children, fathers and loss. I wouldn’t wish it on anyone, and yet it’s good to know it’s not just me.